There’s unrest in the monkey underworld. Click here to play! You’ll have to help Kung Fu Monkey help clean up the streets and you’ll definitely be handsomely rewarded for your efforts. The Big Gorilla has moved into town and he has released his underlings to cause trouble. Start your battle off by spinning in the Kung Fu Monkey logo. This is the highest paying logo in the game as two to five of them will payout up to 2,500 times your line bet. 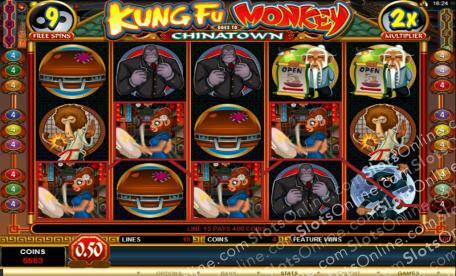 Then spin in the kicking Kung Fu Monkey to get the battle started. This furry ninja will payout up to 1,000 times your line bet. Then you’ll engage in head to head combat with such enemies as the big baby monkey (500 times your line bet), the femme fatale in red (250 times your line bet), the naughty school girl (100 times your line bet), and the Big Gorilla himself (100 times your line bet). There are plenty of other symbols to be spun in, including black clad ninja monkeys, battling baboons, wise ninja masters, and cases full of cash. So, engage in a raging battle with the Kung Fun Monkey for a chance to defeat evil and pick up plenty of cash in reward for your hard work. There are two scatters in this game: The gong and the Chinatown symbol. The former only appears on reels 1 and 5 but when it appears on both it will multiply your win by one and then trigger a number of free spins. The second scatter will also multiply your total bet by one and trigger a second screen bonus game when it appears on reels 2, 3, and 4. The Kung Fu Monkey logo is a substitute and will replace all others, excluding scatters, to help create more winning lines. If you can spin the Chinatown symbol on reels 2, 3, and 4 at the same time, you will trigger the Kung Fu Bonus in which you wlil have to take on a number of opponents to engage in battle for bonus prizes.